Residency Notes » Blog Archive » Healthcare Is A Big Deal! Healthcare Is A Big Deal! I always say that the plural of anecdote is not data but of the hundreds of Iowans I talked to last week not a single one told me health care was the issue driving their Caucus vote. So despite all the coverage it is difficult for me to imagine healthcare playing a major role come Tuesday and the New Hampshire primary. That won’t stop me in linking to some results of a New Hampshire poll concerning views on healthcare. [I]n New Hampshire, the first primary state, there’s a sharp partisan split over government’s role in making healthcare available. As a likely battleground, the Granite State could be a bellwether on the issue in next November’s election. The stark difference between the parties is reflected in the findings of a Boston Globe poll of likely voters in the Jan. 8 New Hampshire presidential primary – 80 percent of Democrats polled say providing health coverage is government’s responsibility; only 30 percent of Republicans agree. Moreover, it explains the dramatically divergent healthcare proposals of the candidates – Democrats would move toward universal coverage and a larger government role; Republicans generally favor tax incentives to expand private insurance and restrain costs through market forces. One of the contrasts is the support (or lack thereof) for individual mandates. And according to Pollster it may explain Clinton’s reluctance to raise the health care issue into the limelight. Clinton’s plan incorporates a mandate. This is a tough one. 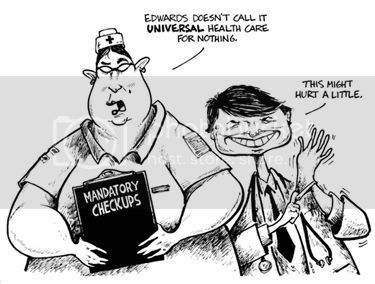 I can see how any “mandate” is unpopular, but I fail to see how universal health care would work without it. If insurers are required to insure people regardless of their pre-existing health conditions, then there has to be a requirement for everyone to get insurance. Otherwise all the would be a disproportionate number of sick people insured relative to healthy people. The risk pool would not be sustainable.